We have a New Year’s party every year and I’m always looking for creative traditions that the whole family will love. 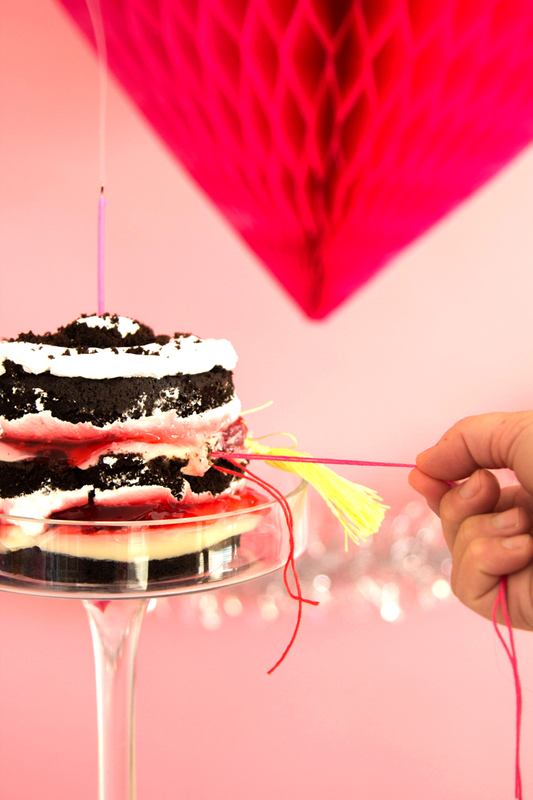 This New Years wish cake can be made for any size party. 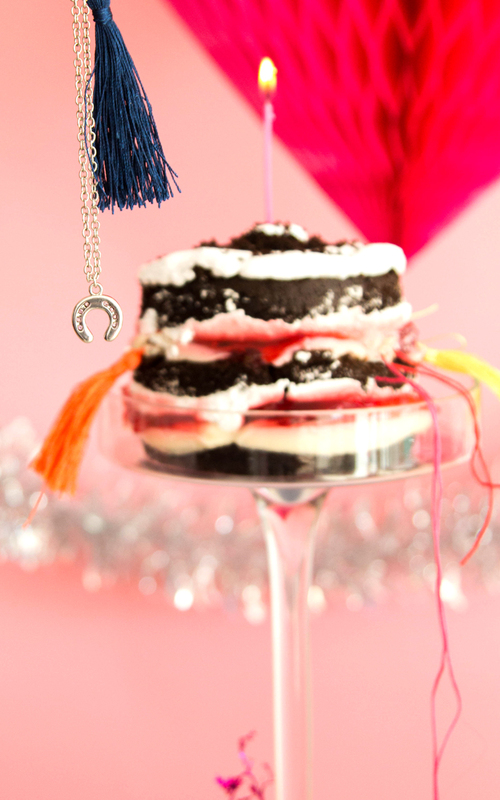 It’s a fun way to make predictions for the coming year and enjoy something sweet together to end the year off right! 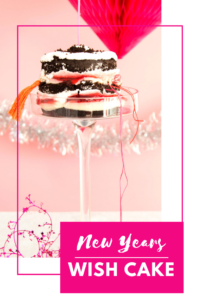 Make your New Years Eve party a perfect treat with these other fun and festive party ideas! Make one wish correspond to each charm and then read them off as your friends pull out their given wish for next year. Then eat the cake, of course! 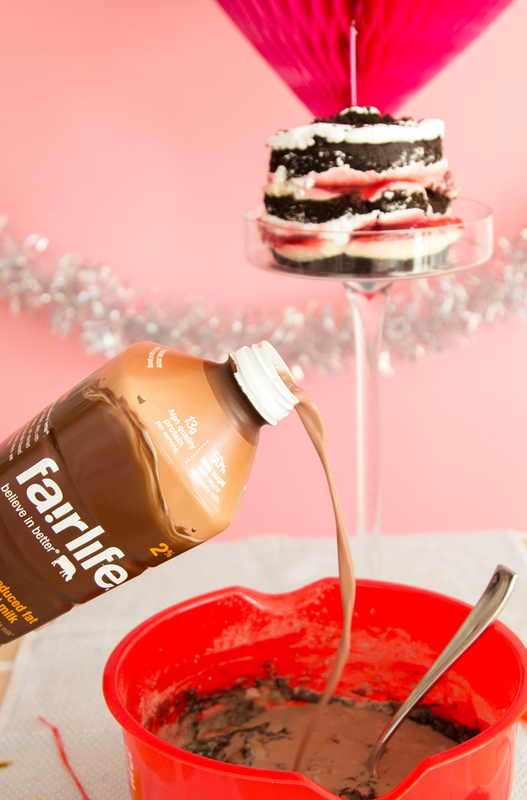 To make our New Years wish cake we used fairlife ultra-filtered chocolate milk because it has half the sugar of regular milk, which makes the indulgence of a gorgeous cake one that we can feel good about headed into the New Year. Fairlie also filters out most of the lactose in their milk, so even my friends who have a bit of intolerance can enjoy the tasty treat. This means I don’t have to leave anyone out of the party celebration. 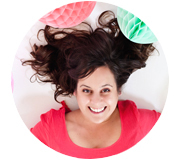 I love being able to serve a cake that looks great and is better for our bodies as well. This recipe is super yummy, so easy, and a fun tradition! Preheat the oven to 350 degrees Fahrenheit. Grease and flour three 6×3 cake pans (or, use one pan and bake cakes one after the other). Combine the chocolate and water in a small saucepan and set over very low heat. Cook, stirring vigorously as the chocolate begins to melt, until the mixture is smooth. Remove from the heat and let cool. Combine the flour, baking soda, and salt, and sift them together onto a large piece of waxed paper. Put the butter and sugar in the bowl of a stand mixer with the paddle attachment and beat until smooth and well blended. Add the egg yolks one at a time, beating well after each addition. Add the vanilla and the cooled chocolate mixture and beat until blended. Add the sifted dry ingredients in three parts alternately with the chocolate milk, beating after each addition until the batter is smooth. In a separate mixing bowl, beat the egg whites until they are stiff but moist. Gently stir one third of the beaten whites into the batter. Add the remaining whites and fold them in. Divide the batter among the three pans. For two of the pans, fill at least half way. The batter for the last pan will fill about 1/4 of the pan. Bake for about 40-50 minutes, or until a toothpick inserted into a cake comes out clean. Note: the third pan will bake for less time, check for doneness sooner, about 30-35 minutes. Remove pans from oven and let cool for about 5 minutes, then turn out cakes onto racks to finish cooling completely. 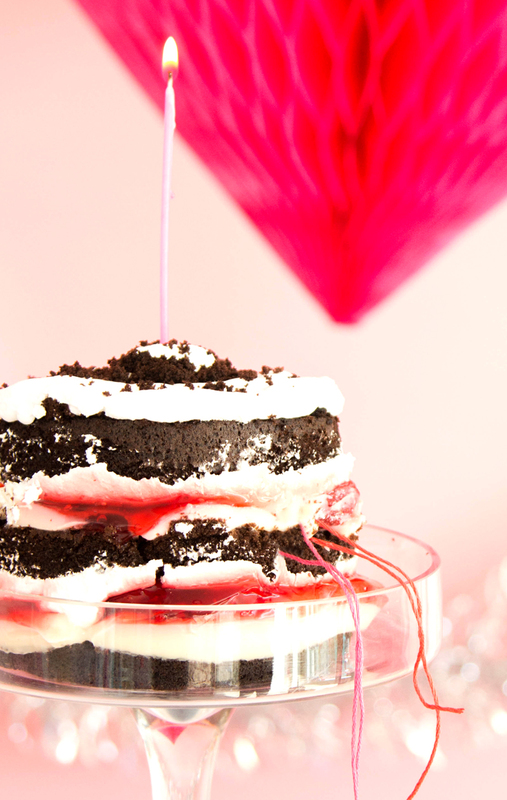 Begin by stacking the layers alternating with raspberry jam and whip cream frosting in between. 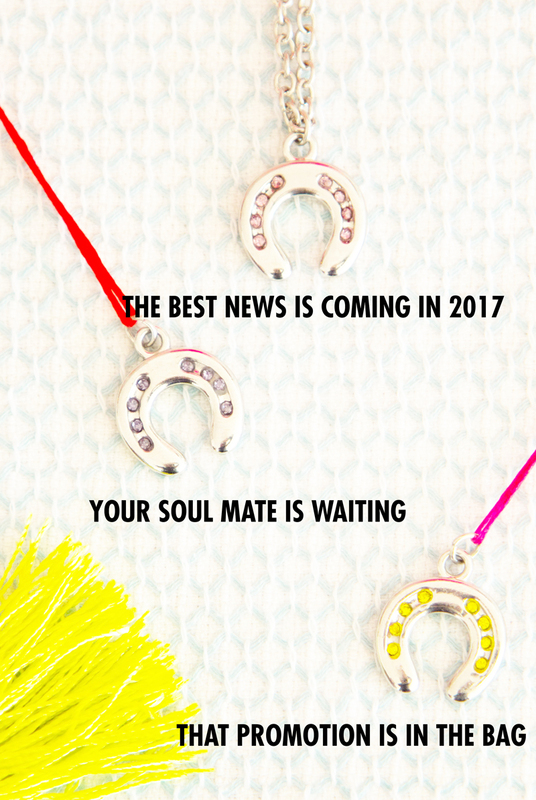 Before placing the next layer - place the wish charms in the middle with a long string or tassel hanging out from each one for pulling. 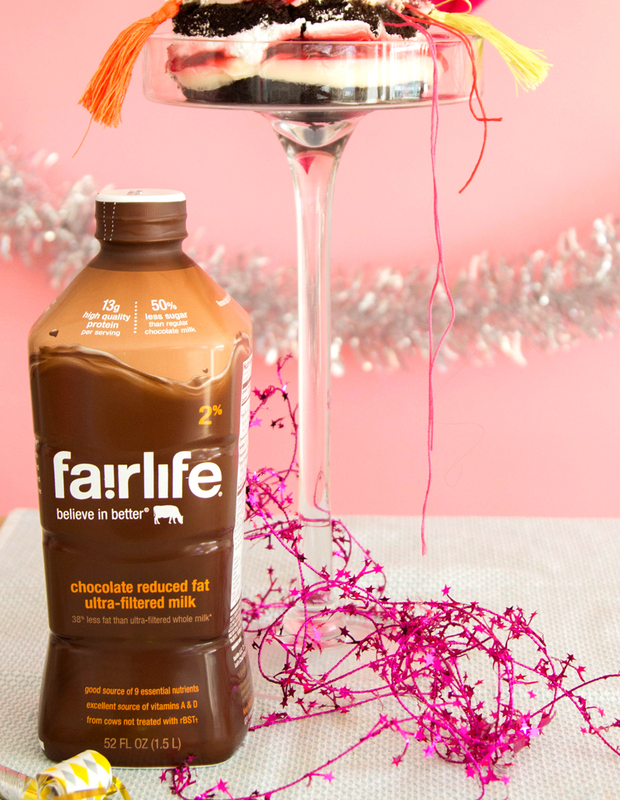 Enjoy your guests thrill when they are given exactly the NYE wish of encouragement they need, and a really great piece of chocolate cake (made with the best milk and ingredients) to start the year off right!